Have you heard of a phone charging wristlet before? A few years ago, I started hearing about these new accessories: wristlets that could double as phone chargers, allowing you to charge your phone on the go. 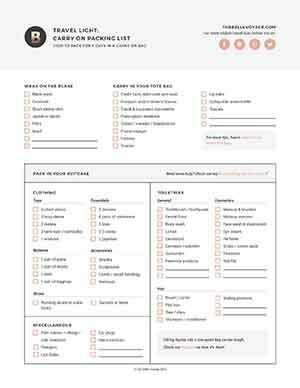 I don’t think I have to explain why this is a game-changer for women who travel. As someone who runs out of phone power on the regular, my interest was immediately piqued, so I shopped around…but everything I could find was a gigantic disappointment. These so-called “handbags” were bulky backpacks or huge messenger bags equipped with solar panels. Nothing wrong with that of course, but the designs didn’t really fit my needs. The main need being: I had to actually want to carry it. With the holidays coming up, I’ve been looking around for gift ideas and it appears that there’s been a revolution in the aesthetics of phone-charging handbags. A marriage of style and technology, if you will. It’s about time. The first rule of phone charging wristlets? Make sure the wristlet will actually fit your phone! And if it can fit any of your travel size beauty products – even better. 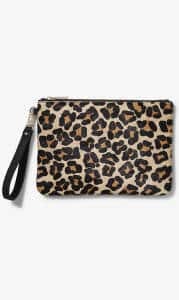 Once you have a wristlet that will charge your phone, you’ll probably want to bring it everywhere. So make sure to pick a versatile color that’ll go with everything in your travel capsule wardrobe. Black never fails, but if you want something more colorful, try a metallic. Not all phone charging wristlets are created equal! Check out how many times the wristlet can actually charge your phone to full capacity. I love wristlets that can also be worn as cross-body or shoulder bags by converting their straps. My absolute favorite phone charging wristlet has to be this one. The metal studs give it a cool-girl look, and it would go with pretty much anything in my travel capsule wardrobe! The sleek Everpurse is a simple but stylish phone charging handbag that truly would go with everything. 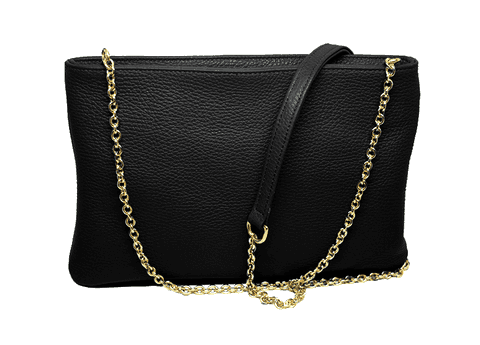 The bag comes with both wristlet and cross-body straps so it can also be worn many different ways. 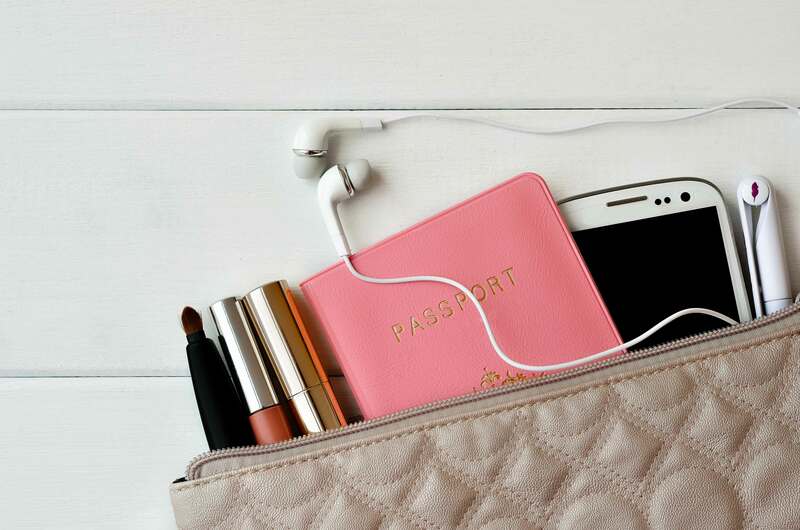 Depending on your phone, the purse has enough juice to charge it a few times – meaning your next weekend getaway could be cord-free. 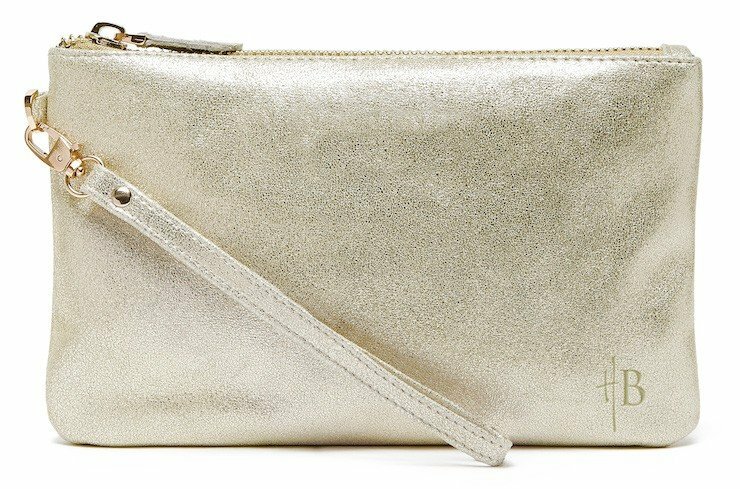 The Mightypurse comes in a TON of different colors, including a few metallic options that caught my eye (gold, you are coming home with me). The clutches start around $85, and there are cross-body versions that are larger and a bit more expensive. Empowered has some serious handbag eye-candy, and I love the story of how the company started. In addition to clutch-sized bags, they also have tote bag options, and I love the metal straps on their smaller purses. 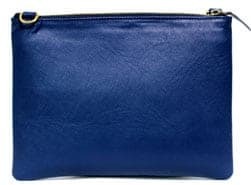 Express tech portable clutch: This is a beautiful clutch-style bag at an awesome price point. I’m pretty sure I paid more than this just to replace my regular phone charger. 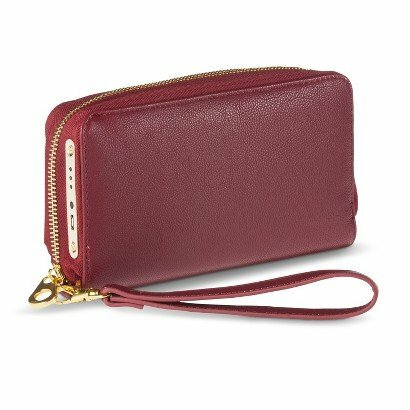 Target also offers phone cases that double as chargers, but they’re styled more like a wallet than a purse – so there’s no extra space for critical items such as lip gloss. That said, they’re small enough to throw in another handbag – meaning that your favorite bag can become a phone charging superhero. The only issue I see with phone-charging wristlets is that there doesn’t seem to be enough of them! There’s only a handful of companies that make them, and unfortunately many of their styles were out of stock. As far as I can tell, the companies above use their own proprietary technology for the charging feature of their bags. Although it would change their business model, it would be great to see one of the companies license their technology to some of our favorite handbag designers. Marc, Louis, Yves – did you get that? That would really open up options for styles! And if Santa decided to leave one of these under the tree for me this year, I certainly wouldn’t complain! There you Have it – All the Best Phone Charging Wristlet Styles! For more travel accessory ideas, check out what’s in my travel tote bag, and the best handbags to go with luggage!